HomeBIBLEIf we don't have His righteousness, we have nothing! Pride comes before a fall, and some people have to really go through a lot before they get humbled. (Pro.16:18)–Like King David! He probably had a lot of spiritual pride that had to be humbled, because look what a great hero he was to begin with! Even as a little boy he fought and killed a lion and a bear to protect his father’s sheep. 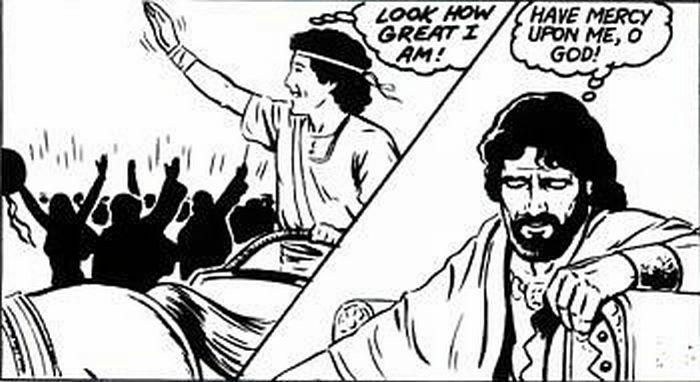 Then he killed Goliath, the giant, and all Israel knew what a great hero he was! (1Sam.17:34-37,49; 18:6,7) But apparently he became lifted up in pride, and thereby fell into great sin. Worst of all, he became a self-righteous sinner because he covered it up and pretended to be so righteous! Finally the judgements of God fell and he lost everything! (2Sam.11,12) But look what a marvellous change occurred in him when the Lord really humbled his spiritual pride! “Now we can join hands and dance with Jesus! Now we can join hands with the children of the King!